A new website aims to add "Steyerville" to the political lexicon as a term for once thriving communities that had their livelihoods stripped away thanks to efforts of environmentalist groups backed by liberal billionaire Tom Steyer. The website, Steyerville.com, was launched on Thursday by Power the Future, a nonprofit dedicated to giving a voice to men and women working in the energy industry who it says are often drowned out by loud activist voices backed by Steyer's billions. It labels places such as Boone County in West Virginia, where unemployment has doubled and 10 percent of the population moved away in just six years, as the home of Steyervilles. The story laid out by the group is that Boone County was thriving because of the coal industry, which in 2010 employed 3,894 of its residents. 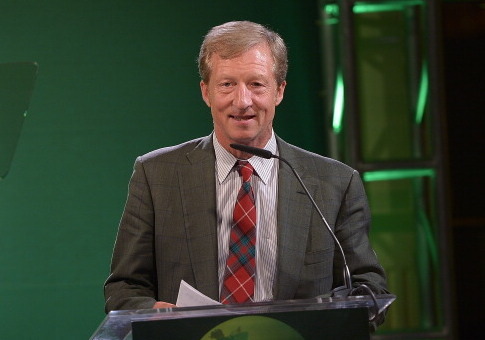 Then came the Sierra Club, an environmentalist group backed by Steyer's millions, which targeted the county's coalmines with environmental lawsuits and pushed them toward bankruptcy. Not only were coal jobs lost—by 2015 coal employment in the county was down from 3,894 to 1,492—but budget cuts were made because of lost revenue. In 2016, Boone County announced that three elementary schools were closing permanently and 60 teachers were being laid off. "What was once a thriving community became a Steyerville," the site explains. Daniel Turner, the group's executive director, says the goal of the site is to hold Steyer accountable for what he is doing to these towns. "We started Steyerville to demonstrate the danger the eco-left poses to rural communities," Turner explained. "These were great small towns, but their industry was offensive to Steyer's politics." "Steyer's activism has consequences, and it's visible in these towns," Turner said. "Every shuttered store, every closed school, every multigenerational family that separates because mom and dad lost their job: This is all on his hands. We will make him own it." The group argues that it is easy for Steyer to ignore the impact his activism has on these communities because he will likely never visit them or even be able to locate them on a map. "It's easy to show indifference to a community you've never met," the site explains. "Steyerville is not in the Hamptons, not in South Beach, not in Aspen. Steyerville is in states people don't often visit, in locations that don't attract the rich and powerful outside of campaign season. And because they are out of sight, they are out of mind." "We made Steyerville to put these communities—literally and figuratively—on the map," it says. "The site is well researched and documented, and will continue to grow to highlight the damage Tom Steyer is doing to rural America." Steyerville currently highlights communities in West Virginia, Ohio, and Pennsylvania, but it plans to expand the map. "We are starting in these three states, but plan to expand nationwide," Turner explained. "New York, New Mexico, Texas, Wyoming, Louisiana all have Steyervilles: towns where Steyer pays activists to prevent the energy industry from operating." Turner also said the group plans to geo-target areas Steyer visits with ads for the Steyerville site. "As Steyer goes around the country to expand his political reach, we plan on running ads warning the locals: Don't listen to him," he said. "Looks at what he's done to communities when he gets his way." Steyer has announced a series of events across the country as he pushes to make willingness to impeach President Donald Trump an issue in Democratic primaries. This entry was posted in Politics and tagged 2018 Election, Tom Steyer. Bookmark the permalink.